The Niagara River's emerald shiner population has dropped drastically in recent years. Photo courtesy of SUNY Buffalo State's Great Lakes Center. Researchers are concerned that climate change could be helping to lay the groundwork for an eventual collapse of the Niagara River’s ecosystem. Populations of the emerald shiner, a minnow that serves as the foundation of the Niagara River’s food chain, have been cut drastically this summer. Researchers worry that as the region heats up, this could become the new norm. The emerald shiner is the primary source of food for many of the larger sporting fish in the Niagara River, such as bass, trout, and walleye. Birds also feast on both the minnows and the larger fish that eat them. Because of the important role it plays in the river’s ecosystem, a long-term decrease in the minnow’s population could have ripple effects. As part of one of the most comprehensive studies to date on the emerald shiner in the river, a team of researchers at SUNY Buffalo State College have been studying both the population size and health of the minnows. The researchers found that the populations have decreased by about 90 percent since 2014, which is when they started collecting data. They also found that many of the fish have health problems, including liquefied livers and gills ridden with parasites. While the researchers aren’t able to pin down the causes of the reduction in the population or health problems, they believe that a series of factors could be playing a role, including temperature change. Officials from the New York State Department of Environmental Conservation said they are not concerned about the decrease, because the emerald shiner’s population can fluctuate wildly from year to year. The agency believes the current drop-off has more to do with high populations of predator fish, like the walleye and yellow perch. But the Buffalo State scientists think there could be more to it. The emerald shiner has survived in this region based on a certain temperature range that suits their bodies. But regional waters are heating up with climate change. At higher temperatures, the fish become stressed and are more susceptible to disease and parasite infections. Buffalo State researchers have collected samples of emerald shiner at several locations throughout the Niagara River since 2014. When the project began, the scientists would scoop up hundreds of fish at each collection site. Now, it’s more likely that they won’t scoop up any at all. They have data indexing the population size from 2014, 2015, and this year. They’ve seen the population reduce by about half each year. The research is funded by the Niagara Greenway Ecological Standing Committee and the US Army Corps of Engineers. While present temperatures might not pose a risk, a series of factors threaten the minnow, including the continued warming of the river, pollution and the urbanization of the riverfront. The emerald shiner is a cold-blooded creature that regulates its body temperatures by migrating to Lake Erie in the winter, which is warmer than the river at that time of year, and returning to the Niagara River and its tributaries in the spring, which becomes warmer than the lake. In the river, the fish can grow and reproduce. According to the Buffalo State study, the emerald shiner become weak when the water hits 77 degrees or higher. This could make them less able to fight off health problems like parasites in their gills and guts, liquefied livers, and fungal infections throughout their bodies, reducing their chances of survival. Over the past three decades, the average temperature of the water in July, measured at the mouth of the Niagara River, has risen by about two degrees Fahrenheit, according to data from the National Oceanic and Atmospheric Administration. The river’s daily average temperature this summer peaked at 76 degrees in August and stayed at that temperature for several days in a row. Beyond temperature, the fish are also threatened by pollution in the river and the urban modification of the riverfront. Because much of the shoreline along the river has been replaced by seawalls, the current has become stronger along the edges of the river. This makes it difficult for the minnow to swim back to Lake Erie in the winter, leading it to stay in the river, which could lead to higher death rates. While temperature alone might not cause a reduction in the populations of the minnows, when coupled with these other stress factors, it works to reduce the odds of their survival, said Randal Snyder, co-principal investigator of the Emerald Shiner Project and biology professor at Buffalo State. Buffalo State is working with the US Army Corps of Engineers and the University at Buffalo to develop fish passageways on the side of the river, aimed at helping to slow down the river’s current. The emerald shiner is the primary source of food for many of the sporting fish in the Niagara River—like smallmouth bass, largemouth bass, steelhead trout, and walleye. The minnow is estimated to make up about 90 percent of the diet of the walleye in the river. If the minnow population is at low levels for too long, there could be a decrease in both the number and physical size of sporting fish in the river, said Snyder. There are other species of minnow, such as the spottail shiner, which the sport fish could eat instead. But that would only be a temporary fix because these minnows occur in smaller numbers in the river than the emerald shiner, said Pérez-Fuentetaja. The emerald shiner is also one of the most popular bait fishes in New York. Scime’s Tackle and Variety, a bait shop on the Niagara River waterfront near the Buffalo-Town of Tonawanda line, typically sells emerald shiner. But right now, you won’t find the minnow on its shelves. 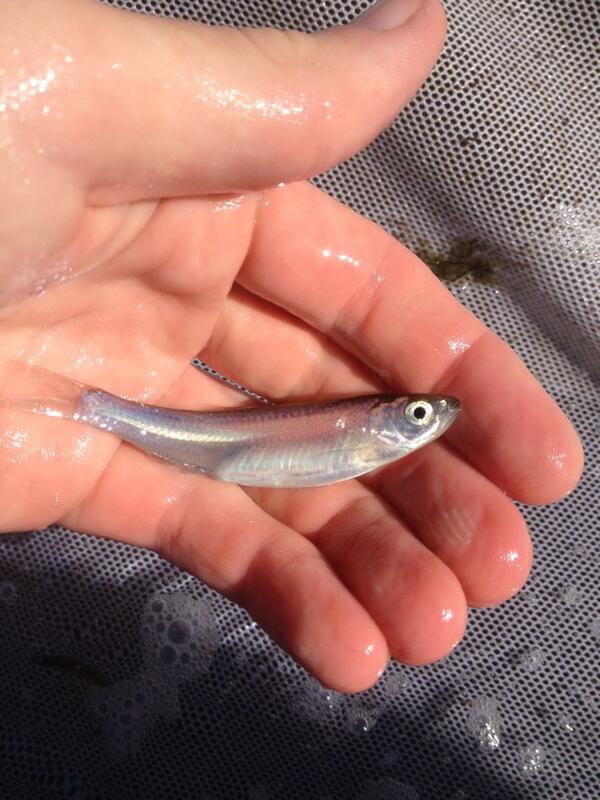 As an alternative, Scime is selling pond-raised golden shiner, another species of minnow, imported from Arkansas. While he makes a profit from selling emerald shiners, because he can catch them himself, he just about breaks even when he sells the imported minnows because of added overhead costs. The fisherman also prefer the native species, he said. Beyond fish, the Niagara River corridor has also been globally recognized as an enclave of bird biodiversity, which includes migratory stopovers of birds on their way to the Arctic. Many of the bird populations eat both the minnows and the larger fish that depend on them. A decrease in the population could disrupt the flow of birds to the area. A decrease in both birds and fish could have economic implications for the region. Sport fishing is an $80 million industry in Western New York. The area also brings in a growing number of bird watchers. DEC said it is not alarmed by the decrease in emerald shiners because it has seen similar sharp decreases in the minnow’s populations in the past. “This is not uncommon for small prey fish species that generally do not live beyond three years,” said a department spokesperson. The agency’s data shows year-to-year declines of more than 80 to 90 percent at five different times in the past 26 years. The DEC suspects that the recent decrease is more likely linked to increases in the walleye and yellow perch populations in Lake Erie over the past five years, which are predators of the emerald shiner, as opposed to climate change. The researchers agree that there are likely a variety of factors playing into the decrease. But while it’s not unusual to see population fluctuations, there have been similar findings of decreased populations of emerald shiner in the lower Great Lakes region, which make the researchers think climate change could play a role. This is the last year of funding for Buffalo State’s research on the emerald shiner. But there are many unanswered questions and more research is needed on the impact of climate change on the minnows and the broader ecosystem of the Niagara River, said Pérez-Fuentetaja. “In the end, if we don’t have anything left, no fish or no birds, or very few of them, it would be a huge impact to the economy of the region,” she said. Sara Jerving is an environmental reporter for Investigative Post, a nonprofit Investigative Journalism Center focused on issues of importance to Buffalo and Western New York. Read more at investigativepost.org.